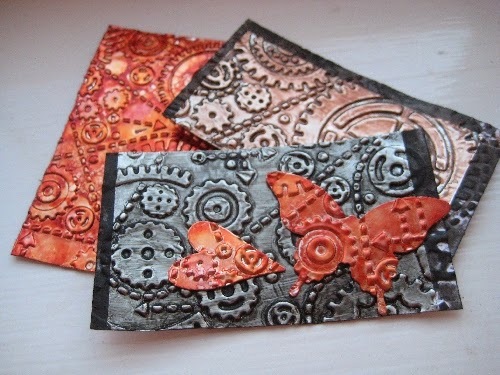 Hi everyone, Nikki here from A2A - Addicted to Art to share some ideas with you on using foil. 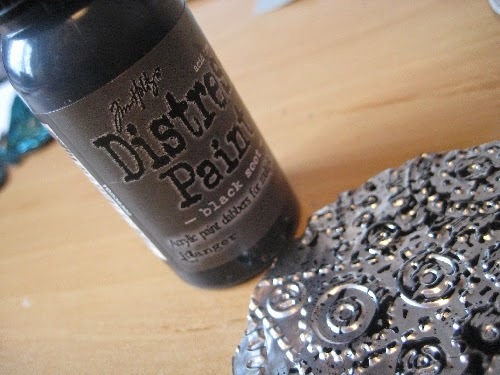 We have seen Tim Holtz use this in several of his tags creating some wonderful effects. As with so many of his products it can be used in many ways and I want to share my favourite techniques. 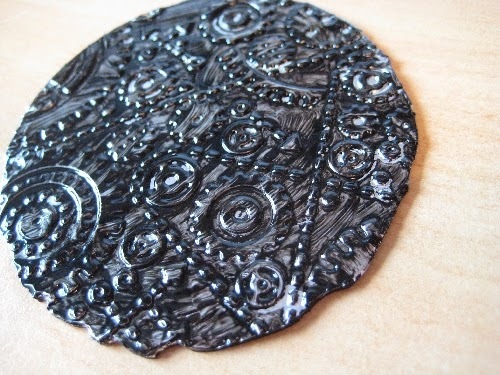 I generally use foil to make embellishments or add some variety or texture to the piece. 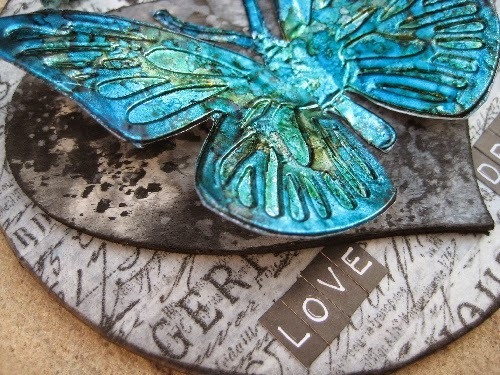 However you can also use it as the focal point, background and to stamp on. 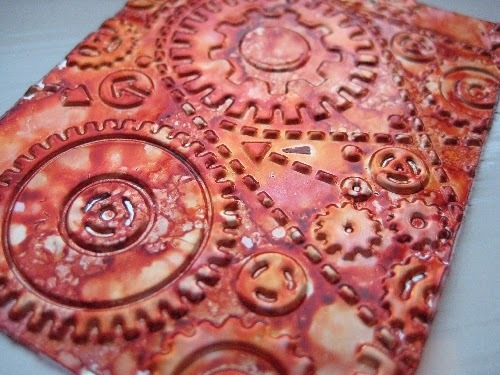 It is often embossed and then coloured with distress paints or alcohol inks. You can also die cut letters to create your own metallic text. I have experimented with embossing my foil both before and after I have stuck it to card (it is self adhesive) and both work fine. It really depends what you plan to do with it afterwards, that is, if you want to maintain the self adhesive nature until after you have embossed and coloured then don't stick it to card! 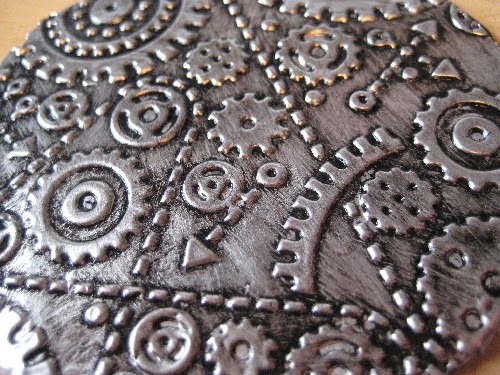 Foil embossed both on it's own and on card using Gears Texture Fade. Alcohol inks are a great way of colouring the foil. Apply a few drops of your chosen colour to an applicator. Gently dab your foil distributing the colour but not mixing them too much if you have more the one colour. 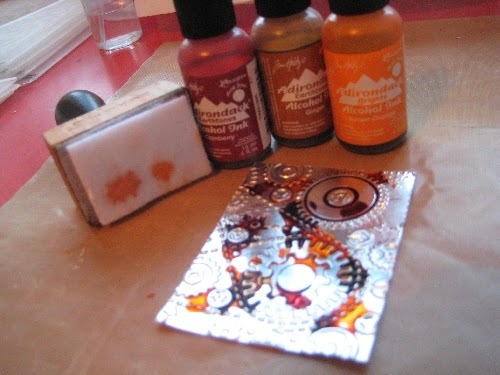 Use alcohol blending solution or an alcohol hand gel to clear your craft mat! 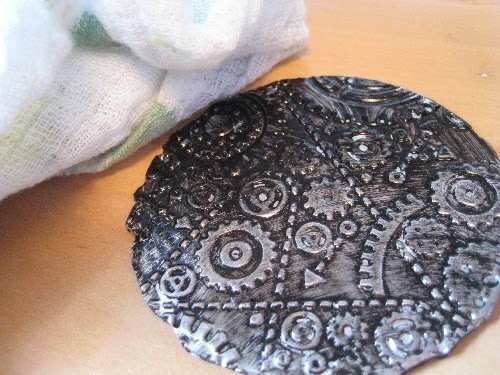 Once dry you can lightly sand the textured surface to reveal a bit of the metal. 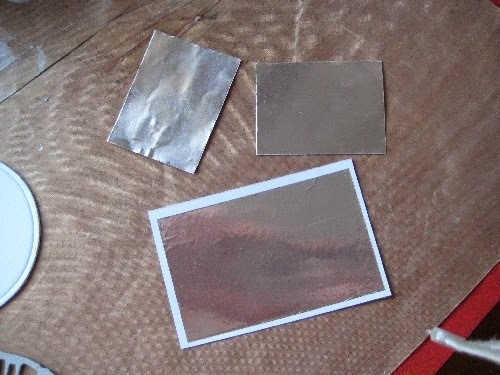 My personal choice for colouring my foil is to use distress paints. 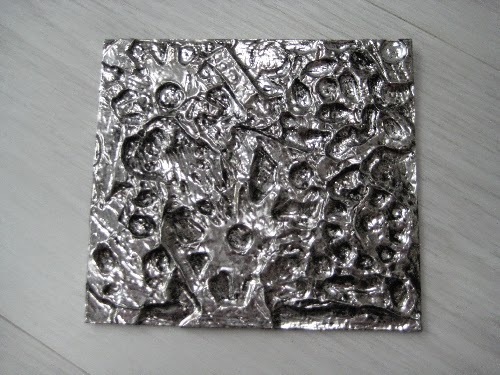 The key here is to work it into the embossed areas of your foil (I dab it on and then get it into all the crevices with my finger) and remove some with a soft cloth before it all dries. 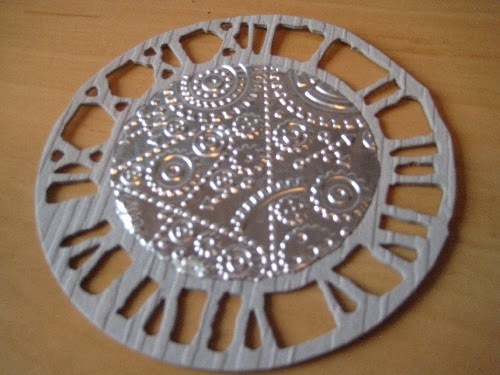 I cut and embossed a piece of foil to fit inside the weathered clock. Dab on some black soot DP and use my finger to move around. Allow it to stand a short time. Gently remove some of the paint from the surface. Once happy leave to dry or use your heat tool. Don't forget it is METAL and it will get hot! It's fun to create your own textured backgrounds and then follow a similar process. 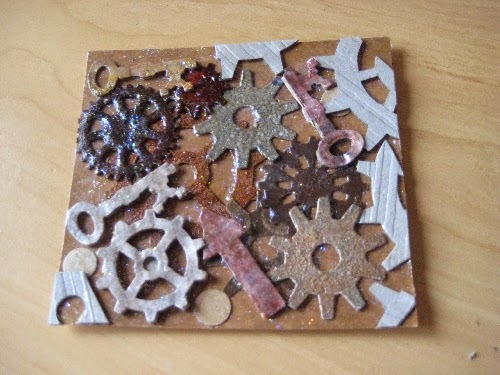 I added lots of left over bits and pieces to a piece of card, stuck them down and left them to dry. I then removed the backing and placed the adhesive foil sheet over the top and carefully pushed it into the spaces around the shapes. It might tear a little depending on the thickness of your bits - mine did - but you can't see it once the paint has dried. 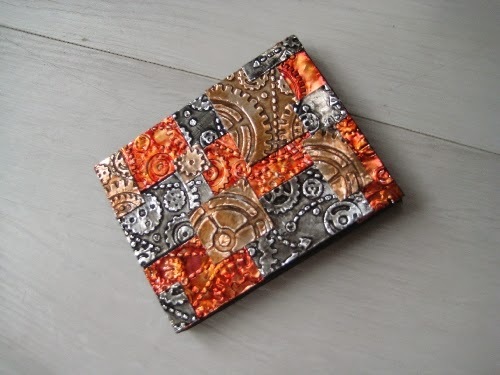 Once I had created a few different foil sheets below I decided collage them onto a mini canvass. Another project to add to the 'to be completed' pile. And finally something I have finished. For this little hanging I have used a foil embossed butterfly coloured with alcohol inks as the focal point. 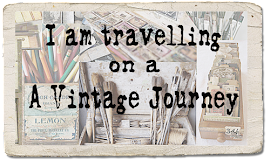 There are a few more details over on my blog today. 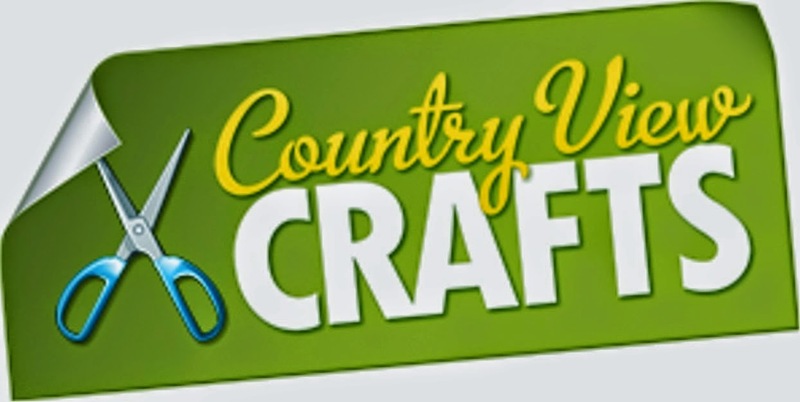 You can find many of the products I have used at our wonderful sponsors, Country View Crafts. I have included a few links below. 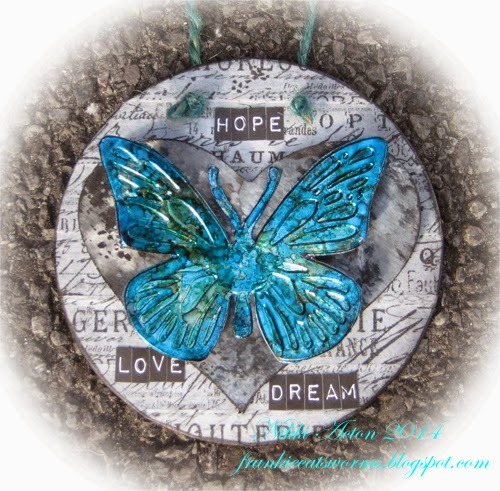 For more inspiration from the master himself here are two links to tags using foil. I hope this has been useful, thank you for looking. 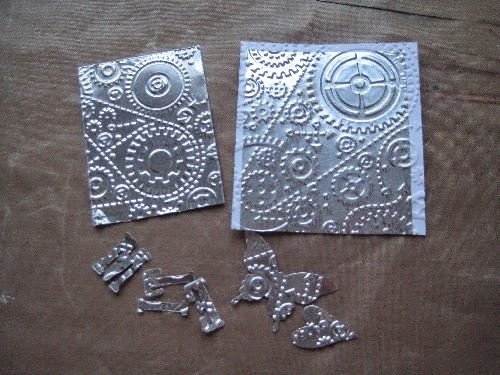 Those are the same foil tapes I used on my project too, they are wonderful! Love that they are already sticky. Wonderful tut Nikki, showcasing sm great techniques and your butterfly piece looks great!! Great tutorial, Nikki! Thanks for the tips! Lovely hanging at the end of your post! Have a great day ! Love these techniques and the butterfly looks great. Thanks for sharing the techniques with us. 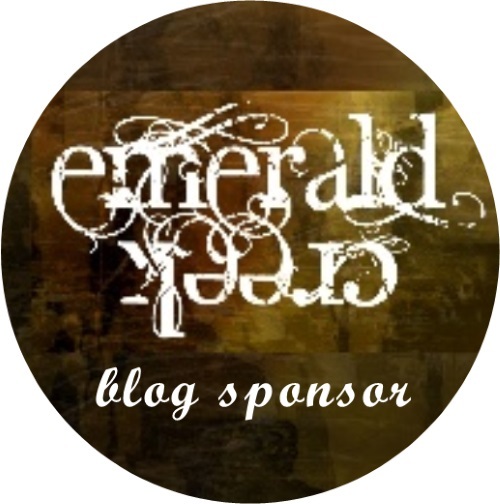 Hello Nikki, I just started following this blog very recently. Thank you so much for this detailed information. It is absolutely helpfull. I just started using Tim Holz' products 2 weeks ago so I still have to catch up A LOT. Catch up in learning the techniques and catch up in buying all the products. (This is the only time in my entire life that I wished I was rich, just to be able to buy all these wonderfull products all at once, sigh) Anyway I love this journey I am on right now and thank you Tim Holz. 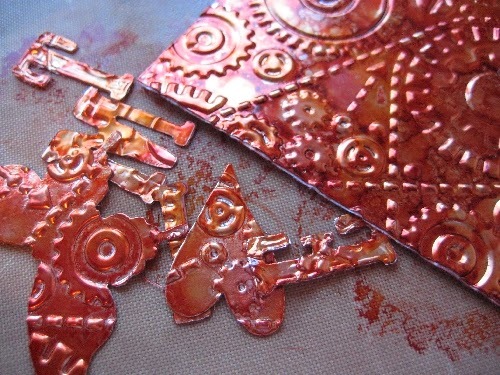 This is such a lovely project, I love using metal on my projects too. 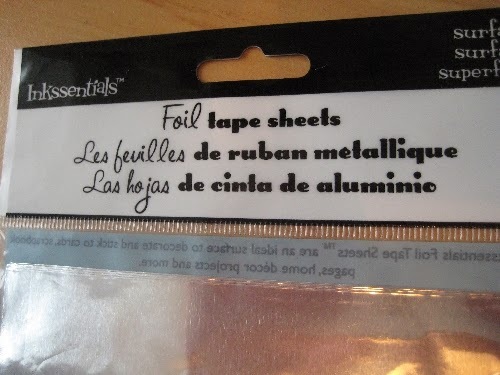 Love the way you used that Foil Tape! So many different and fun ways to use that foil. A wonderful DI share, Nikki! Hugs! 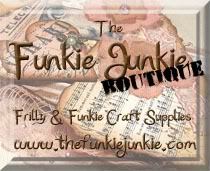 What a fantastic tutorial, Nikki - so many creative ideas... I wish I had time to go and play now!! Sorry I'm so late catching up!